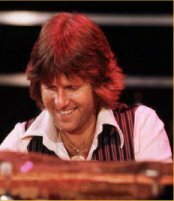 Born November 2, 1944 in Todmorden, Lancashire, England, Keith Emerson began playing piano by ear at age 4 by picking out melodies of show tunes he heard his father playing. He started taking lessons at age 8, but never really received much formal training beyond a few years of private lessons. By the age of 14, he was supporting himself musically by playing dance halls, bingo sessions, and accompaniment at his aunt's ballet studio. In his late teens, he moved to London and joined the band Gary Farr and the T-Bones, touring Germany, France, and Britain. His early influences were primarily jazz artists such as Fats Waller, Art Tatum, Wynton Kelly, Jimmy Smith, Oscar Peterson, and Jack McDuff. Classical composers also became influential in his music including J.S. Bach, Aaron Copland, Rachmaninoff, Bartok and Alberto Ginastera amongst others. In his twenties, he formed a band called The Nice, to back jazz/blues singer P.P. Arnold in England.